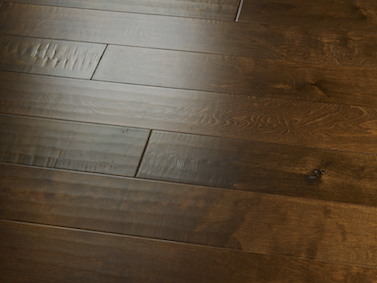 One of the biggest trends in hardwood flooring is to let the natural character of the wood show through. That character is, after all, why we love wood so much in the first place – it has a depth and beauty that no other flooring can match. Look for soft rustic, lightly sculpted character-grade goods to very aggressive, rough planks, as well as distressed floors and wire brushing that bring out wood's inner beauty. Of course, you can opt for a smoother, monolithic finish for a more refined look. Hardwood floors are once again moving toward the lighter shades as the influence of grays and softer browns continue to grow. The warm red and amber influences we’ve seen for the past several years are giving way to cooler colors like gray and natural finishes. 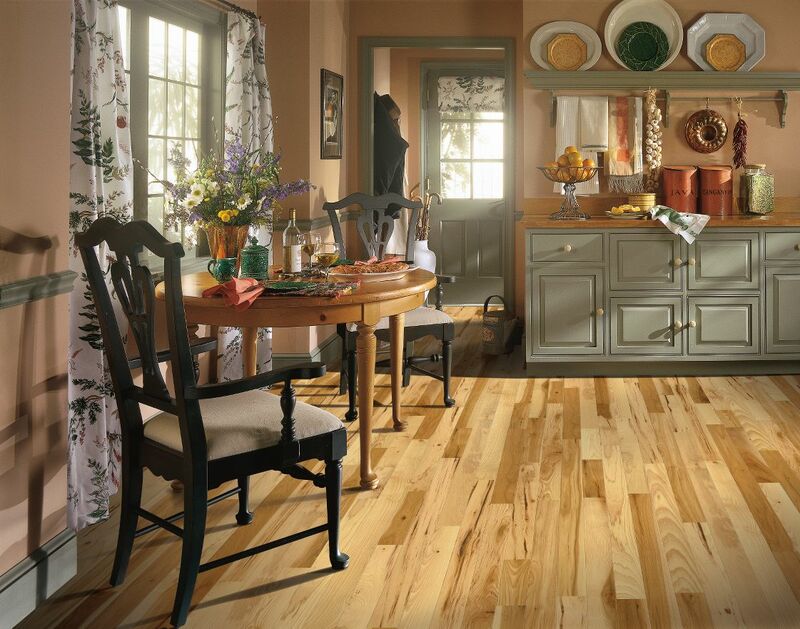 We’re also seeing more depth of color and character as flooring manufacturers have improved their staining and finishing techniques. 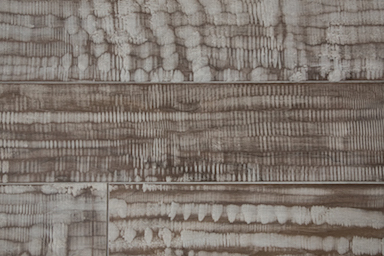 Grays, in all variations, and natural wood colors are everywhere. Wide plank floors – defined as wood floors that are at least three inches wide, but can measure up to a foot wide – are popular and lend themselves to a variety of decorating styles, from elegant and formal living rooms and dining rooms, to comfortable and casual family rooms and eat-in kitchens. Low gloss, matte finishes have moved in to replace the high-gloss shiny finishes of the past. 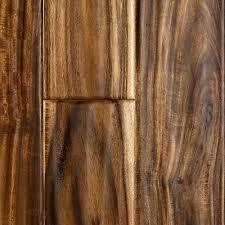 Great for hiding scratches, matte finishes seems to bring out the raw, natural beauty of hardwood. These are often combined with distressed and wire-brushed looks. Also popular are oil finishes with some manufacturers able to offer the same look without the drawbacks of real oil finishes. Look for saw "chatter" marks (where the saw blade skips roughly over the plank), "wormholes" (don't worry, they're probably not real), gouges (sometimes those are real, sometimes hand applied), wire brushing and hand scraping for a worn and timeless appeal that makes the floor look like it has aged in place. New manufacturing techniques deliver the long, sleek look that is so popular today. While still mostly at the upper end of the market for boards up to 10 or 12 feet long, expect these longstrip constructions will make their way to mid-level price points in the near future. 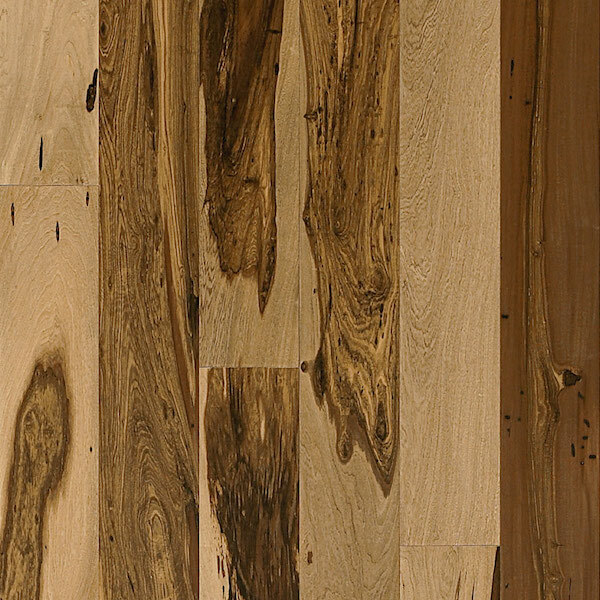 There will always be a market for solid wood flooring, but there’s no denying the growth of engineered flooring, which is more stable and offers flexible installation options, such as staple, glue-down and floating techniques. 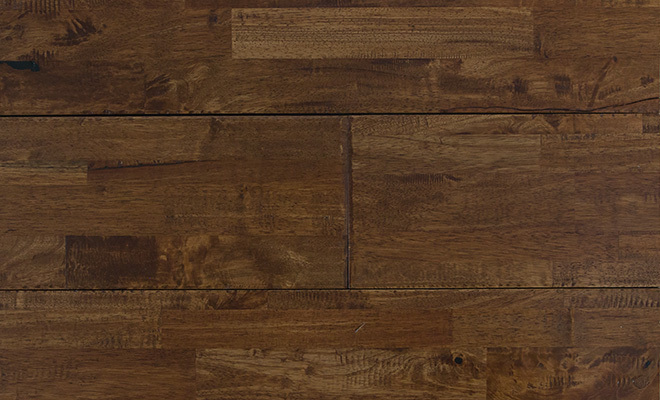 More versatile, these engineered floors can often be used below grade. It’s all about customization—patterns, borders, even medallions, as simple or intricate as you like. While custom hardwood can get expensive, manufacturers are making it more affordable with pre-assembled strips and medallions for at truly custom look. Of course, you can always add a border simply by using a contrasting hardwood product. In fact, using complementary shades within the same collection creates a dramatic floor with lots of visual interest and color variations. Yes, you can have an exotic looking floor and, no, you won’t have to decimate the tropical rainforests to do it! Exotic hardwood flooring has been one of the hottest selling products in hardwood flooring category but today we’re seeing more “domestic” exotics (which are not actually exotic species – the rainforest thanks you) but have the look today’s consumers want. This is achieved primarily through the use of different species such as hickory, and new surface treatments. Color washes and pickled treatments create a unique surface that looks worn but thoroughly modern at the same time. Color, too, is making its way into the wood category. Look for washes of white and gray as well as some darker shades for an almost painterly look. Not a full blown trend on its own with lighter shades of wood coming on so strong, but as a counterpoint to the growing trend toward lighter woods, don’t be surprised to see plenty of darker woods available. Darker storylines remain in demand, as they have been for several years. Look for rich colors, such as chocolate browns and smokey looks that can create an intimate feel for any setting. As I've said before, natural wood - light or dark - is always in style. 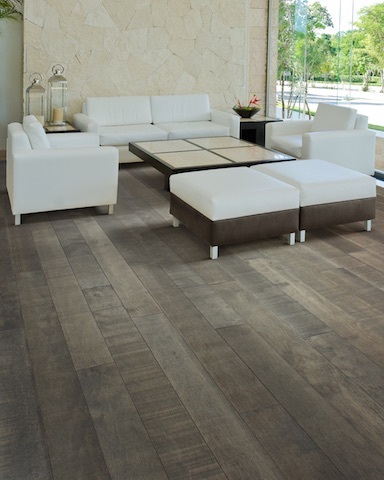 Mannington Atlantis Prestige - showing off wood's natural character. Light & Natural. Armstrong Flooring Hickory Country. Pantim Seringa Cider in wide planks. Long boards from American OEM, Summer Storm. Hallmark's Sedona in darker shades.